Reverse osmosis (RO) systems offer power plant owners and operators a reliable and well-proven water treatment solution. However, designing and caring for an RO system requires a thorough understanding of a plant’s water supply and the technology’s capabilities. The information presented here could help plant engineers design and optimize an RO system to match their needs. The success of a new RO membrane system is often directly related to its pretreatment. The previous section of this article discussed RO design issues and introduced how a pilot study should include a study of its probable pretreatment equipment since the pretreatment performance will directly affect the performance of the RO system. However, piloting the upstream processes can be challenging in sizing these components for the pilot RO unit’s low flow rate. The most important role played by pretreatment is protecting the RO from incompatible substances. With the polyamide thin-film RO membrane commonly used today, the biggest concern is removal or destruction of any chlorine, or other potentially oxidative compounds. This membrane has very little tolerance to free chlorine (present in many municipal water sources), and is only slightly tolerant of chloramines (in other municipal water sources). The most common methods for breaking down chlorine are reducing-agent injection and activated carbon filtration. The most common reducing agent is sodium bisulfite (NaHSO3), which reacts preferentially with free chlorine in breaking it down to the innocuous chloride ion. Sodium bisulfite/sulfite injection systems can fail in ways that degrade RO membrane elements if not quickly remedied. The day tank could run out of solution, or the injection pump could lose power or pump-head prime. The injection pump setting might provide insufficient chemical to handle the full range of chlorine concentrations, or might be set for such a low pulse speed that the chemical does not sufficiently mix with the feedwater. The proper NaHSO3 dosage should be injected any time the RO inlet valve opens, even if this opening is for filling the RO or for flushing it out before a shutdown. There should not be significant pipe length distance between the point of injection and the RO inlet valve, because this length will become fully chlorinated during shutdown by chlorine diffusion. The point of NaHSO3 injection should be immediately upstream of the inlet isolation valve. Activated carbon filtration may offer a more reliable means of breaking down chlorine. During manufacture, non-carbonaceous materials are burned off, leaving porous granules with a high amount of pure carbon surface area. This has a high attraction for adsorbing almost any contaminant, including most organic materials and heavy metals, although there may be limited removal capacity for some contaminants that are shed into the effluent water. The breakdown of chlorine by activated carbon involves an electrochemical reaction, which offers a high capacity for chlorine removal. The carbon gives up electrons to the chlorine atoms, forming innocuous chloride ions (Cl-) that remain in the water. In this reaction, oxygen atoms previously bonded with the chlorine atoms as hypochlorous acid (HOCl) now attach to the carbon surface. Because the carbon also reacts with dissolved oxygen in the water, the carbon surface can become fully oxygenated. It then loses its ability to remove additional chlorine, but this typically takes a few years with inlet chlorine concentrations less than 1 milligram per liter (mg/L). When ammonia is present naturally or when added by a municipality, chlorine chemically bonds with the ammonia to form monochloramine (NH2Cl) or possibly dichloramine (NHCl2). The chloramines are not as chemically reactive, and require more carbon volume for their breakdown. A catalyzed carbon media is available at an increased cost that improves the carbon reactivity with chloramines and reduces the need for oversizing the carbon filters. Carbon system valves must not leak or otherwise bypass. They should be normally closed and driven by sufficient air pressure to prevent chlorinated water from reaching the RO system. Maintenance is critical to the success of either reducing-agent injection or carbon filtration. It is recommended that the activated carbon media be replaced annually, or based on an increase in the effluent concentration of total organic carbon (TOC), to prevent the shedding of biological particles into the RO system. Over-injection of sulfite causes increased breakdown of dissolved oxygen in the water. This increases the potential for heavy growth of slime-forming species of bacteria, which can quickly foul an RO system if there is a sufficient concentration of organic food in the water source. This potential can be minimized by maintaining a residual sulfite concentration that is greater than zero but less than 2 mg/L as sodium sulfite, measured using a low-level test with sensitivity of 1 mg/L or less. As long as the sulfite concentration is greater than zero and it is well mixed into the feedwater, free chlorine will not be present. There is typically at least one salt in any natural water source that will concentrate beyond its solubility and potentially form scale. Preventing scale formation (Figure 1) should not be a major challenge unless the water source has an unusually high concentration of a slightly soluble salt, or unless the RO is being operated with an unusually high permeate recovery. Scale formation may be prevented by injecting an acid into the inlet water, by softening the water, or by injecting a chemical scale inhibitor. Usually the least expensive method is a scale inhibitor, which slows the rate at which salt crystals grow when their solubility is exceeded. Acid injection prevents calcium carbonate scale formation, but leads to an extremely high concentration of CO2, which is not removed by the RO system and places a high removal demand on downstream ion exchange processes. Also, acid injection alone doesn’t offer much protection against the formation of sulfate or certain other scales. 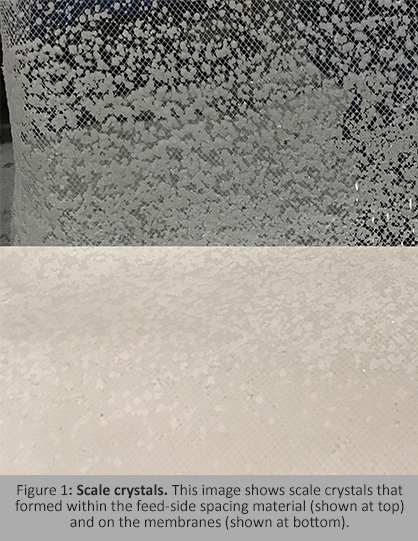 Softening offers several advantages, but suffers from high capital and operating costs, unless there are particularly low concentrations of calcium and magnesium hardness in the water. The softener also removes other potential scale-forming ions such as strontium and barium, and removes metals that would otherwise foul the RO system, such as iron, manganese, and aluminum. But the softening resin also fouls with the metals and then requires periodic chemical treatment. Scale-inhibition chemical suppliers often use software programs to estimate the potential for scale formation. These programs predict the concentrations of salts present in the RO concentrate stream, as well as its pH, to determine how much scale inhibition chemical is needed. The potential for silica scale is common with certain groundwater sources in the western U.S. Inhibition formulations have shown varied success. Maintaining warmer water temperatures improves silica solubility, as does changing the water pH. Increasing pH is a common strategy, although the water must first be softened to prevent hardness scale from forming when a caustic chemical is injected to raise the pH. When using a scale inhibitor, it is critical to rinse the RO system of its increased concentration of dissolved salts whenever the RO shuts down. Otherwise, scale particles grow and stick to the membrane surfaces during the shutdown. This rinsing process should be automated and is often performed with low-pressure inlet water. Low pressure reduces the RO permeation that tends to concentrate the dissolved salts. A better rinse might be performed with pressurized permeate water if a line can be plumbed back to the RO from a permeate storage tank system. The permeate is biostatic; its use reduces the formation of biological solids within the RO while shut down. Fouling doesn’t necessarily reduce RO membrane life if the RO is effectively cleaned. If the RO is allowed to foul too severely and cleaning is not effective, then the membrane will likely continue to lose performance. It is common to include a filter housing on the RO system inlet that contains 2.5-inch-diameter cartridge filters (Figure 2), whose pore size is nominally rated. The actual ability for removing smaller particles can vary greatly. Some (regardless of rating) only protect the RO against large particles that might get caught within the membrane flow channels or damage the high-pressure pump. These are inexpensive and may last weeks before an elevated pressure drop indicates the need for replacement. Tighter porosity filters that can remove more of the incoming suspended solids are more expensive and also require more frequent replacement. Therefore, the use of these tighter filters becomes more economically viable if the concentration of suspended solids in the water has been minimized by upstream treatment. It is sized for a downward flow velocity approaching 2 feet per second. It has a lower collection lateral system designed to obtain uniform flow distribution across the media when the filter is operated at low flow velocity, while also allowing the entry of a sufficient backwash flow rate for a 40 percent bed expansion. The filter is backwashed before its previously removed smaller/fine particles are shed, which may occur before there is an appreciable buildup in filter pressure drop. After backwashing, the filter is forward-rinsed at its service flow rate until its effluent quality is acceptable (such as based on effluent iron concentration, turbidity, or SDI). The preceding points do not provide all the filter design requirements, but were chosen because these particular guidelines are often not followed (mostly because they would increase the filter’s cost). Some water sources may contain unusually high concentrations of fine particles. In these cases, it may be necessary to send the water through large reaction tanks intended to give the particles more time to coagulate into larger particles that can then be more easily filtered. An inorganic chemical coagulant (never a cationic polymer) may be added to the water upstream of the tank to speed the coagulation process. The coagulant is most effective if it is first well-mixed with the suspended solids. If soluble metals (such as iron or manganese) are present in the water source, some percentage will be oxidized by allowing the water to contact atmospheric air in the tank, although this percentage is typically small. A chemical oxidizer such as chlorine (bleach) can be added to the water to oxidize the metals into their insoluble oxides (actually into their hydroxides when present in water) prior to coagulation. 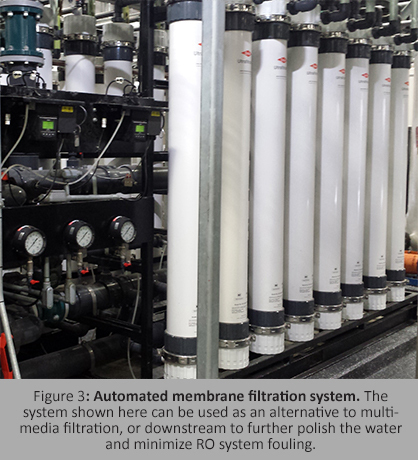 Membrane filtration is becoming more common in various applications, including pretreatment for RO systems. It can often provide water that is more consistently low in its concentration of suspended solids than that provided by a pressurized multimedia filter. Therefore, these systems may be used as an alternative to multimedia filtration, or possibly downstream to further polish the water and minimize RO fouling. The most common configuration is hollow-fiber technology. Fibers of an inert polymer are extruded with a hollow internal region, or lumen. The fibers may be relatively fine/small in diameter where the inlet water passes around the outside of the fibers, and through the fiber wall to the fiber lumen. It then moves toward one end of the module for collection. Because the fibers are tightly packed, flow movement around them is not uniform. Feedwater particles will come out of suspension on the membrane surface as the water goes through the fiber. They are not concentrated within a passing stream as the particles mostly would be with spiral-wound RO, so there is no concentrate stream. The systems are simply operated at 100 percent recovery, except for the water losses from frequent backwashing with filtered water, resulting in an overall recovery of 90 to 95 percent. There also are modules with larger fibers that use an inside-out service flow direction. The fatter fibers offer improved membrane surface flow characteristics for better distribution of the fouling solids, while the finer fibers offer the cost advantages of more membrane surface area in the modules. The membrane filtration systems (Figure 3) should be sized to keep the fiber pressure differential (transmembrane pressure, TMP) relatively low to prevent compaction of solids against the fiber and into the fiber pore structure, and to reduce the potential for fiber breakage. This may mean sizing the fiber for a filtrate flux rate of 30 gallons per square foot per day or less. The fiber modules are backwashed using the filtrate water at a frequency of roughly once every 30 minutes, again to try to keep the solids from compacting and to prevent particles from getting forced into the pores and subsurface structure. Some manufacturers reduce the backwash volume by knocking the solids free with compressed air. Backwashing alone may not fully restore the original TMP, and a chemically enhanced backwashing may be required. If this fails to restore original performance, a circulated cleaning for an extended period of time may be needed. It is not only feasible, but it is practical with larger RO systems to design chlorine destruction and scale inhibition systems with safeguards to prevent any problem with their operation from compromising the RO membrane life expectancy. For example, an oxidation-reduction potential (ORP) instrument can continuously monitor the RO inlet water for the presence of an excessive concentration of any oxidant, like chlorine. It can be interlocked with an alarm system to shut down the RO if its reading remains high for an appreciable period of time. When relying on chemical injection systems, the RO membrane should be protected from both the absence of the injected chemical, as well as from an excess of that chemical. The inclusion of automatic isolation valves on the chemical injection lines located just prior to their points of injection into the water lines will prevent chemical dumping while the RO is shut down. This often occurs when compressible (which also means de-compressible) air collects over time within the injection line. The valve actuators should be programmed to close during the RO shutdown process prior to the water line pressure declining and in conjunction with the stoppage of the associated injection pump. The operation of a chemical flow sensor located on each chemical injection line can be interlocked with an RO alarm and shutdown function. This feature can protect against faulty programming that results in negligible chemical being injected, while also protecting against an injection pump failure or failure to replenish the injection chemical. While the 100 percent correct operation of the chlorine destruction and scale inhibition systems would be considered to be critical to the success of the RO system, it may not be practical to remove 100 percent of the suspended solids from the RO inlet water. It then becomes subjective as to whether to invest more capital into the upstream media filters or ultrafiltration system, versus planning to spend more operating money in the cleaning of the RO membrane elements as related to their increased rate of fouling due to a higher concentration of suspended solids in their inlet water. A higher rate of membrane fouling does not necessarily mean that the life of the membrane elements will be reduced, not if the RO system is successfully cleaned when needed, as based on the RO operating data. This will be one of the topics discussed in the next section of this article, which covers the operation and maintenance of the RO system.